Meet Scully, my new poodle puppy. I know you were expecting a comic, but I have some important news, and the easiest way to make sure people see it is to insert it as a regular new "comic". I've decided to put new Irregular Webcomic! strips on hiatus for the remainder of 2018. 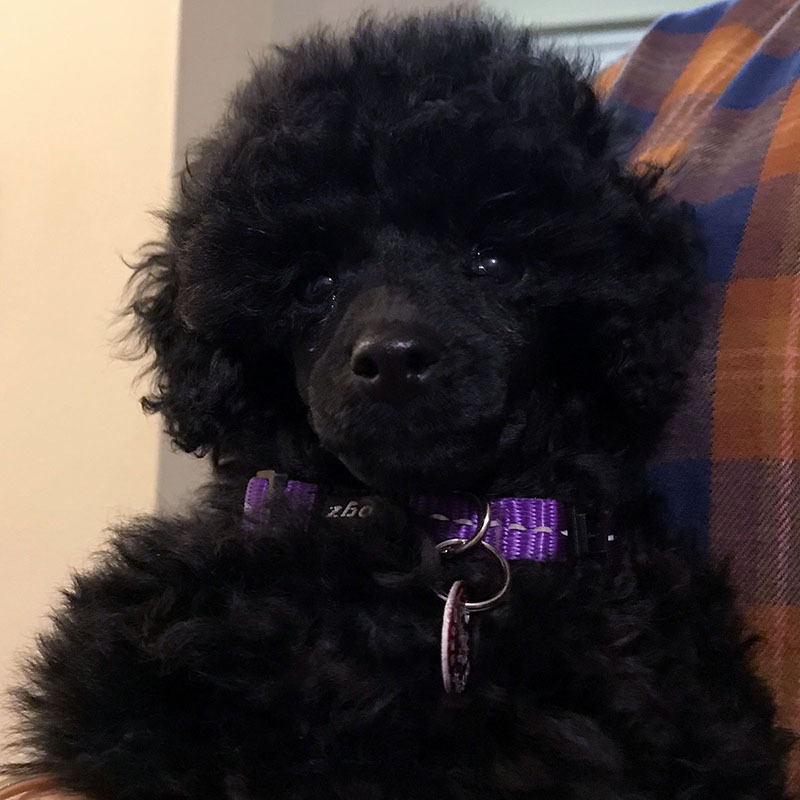 My wife and I recently got this toy poodle puppy, and neither of us had the experience nor were prepared for how much work it is to raise a puppy into a well-balanced and behaved dog. The first two nights we had Scully I had zero hours of sleep, and since then I've been operating on maybe four hours a night every night. I am constantly tired, and during the day it's almost impossible to concentrate on anything other than looking after Scully and trying to catch her before she toilets inside the house. It's simply not possible for me to make new IWC comics until we get her fully house trained - which I understand may take a couple of months or more. And I expect it will take a while after that to get back into some sort of productive routine and rebuild my comic buffer. I expect this will also affect the recently announced change to the update schedule of Eavesdropper as well, and I will probably put that on hiatus too. For the moment, I am going to try to keep up production of Darths & Droids without interruption. It's my most popular work by far, and it's the least production intensive while I am at home, as most of the work gets done in the lunch room at work. I'll also continue to accept and publish comics for Lightning Made of Owls (and check out the comic submission contest! ), The Dinosaur Whiteboard, and iToons. Square Root of Minus Garfield will also continue uninterrupted under the administration of Manyhills. My IWC buffer is now zero, with #3882 the last one I made. So that will be the last new comic for 2018. At the moment, I plan to restart new comics from 1 January 2019 - though it's possible that plan may change. In the meantime, I'll increase the rerun schedule to every day. Sorry to have to do this, but I need to in order to cope with my current situation. Apart from raising a puppy and the resulting lack of free time, things are fine in my life, and there's nothing to worry about. Oh, and yes, we don't just have Scully. We also adopted a kitten, which we named Mulder. They get into some arguments, but at other times they get along nicely.